A fantastic vintage industrial glazed steel medical cabinet. 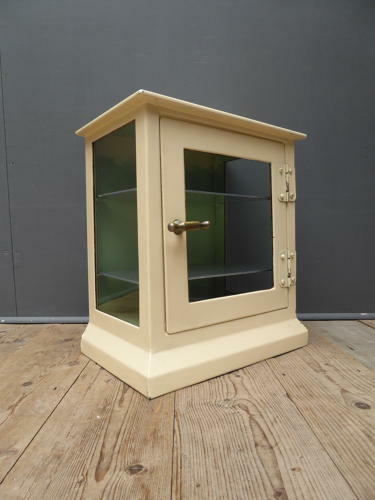 With a wonderful large cast brass handle, two perforated aluminium shelves(removable) & a cracking coat of old paint both inside & out. A great piece with a stunning industrial look, perfect for the bathroom or general display. Wear commensurate with age & use, glass undamaged. Clean & ready to use. Collection a must due to glass, please enquire should you wish to send a courier.